This post has come about from the daily prompt but they have asked for a post about personalities… But the title from the Grinch got me thinking about picture books. Particularly as I’m putting one together myself at the moment. 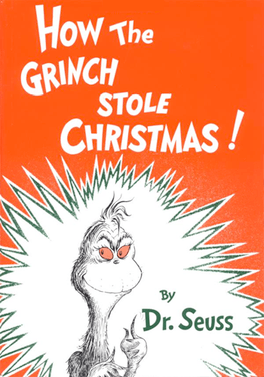 ‘How the Grinch stole christmas’ by Dr Seuss is a picture book that has been turned into animations and a movie. The original though is a simple book of rhyme and simple illustrations in only three colours; black, white and red. Yet read it to any child and they are captivated. So what makes a good picture book? Well it isn’t an easy option. I have found that balancing the pictures and the words difficult. If you want the instructions on how to go about making a picture book then I recommend Words and Pictures by the Society of Children’s Book Writers and Illustrators (SCBWI BI). Go and check it out – I use it regularly.